When I came across this fascinating piece on robotic mining trucks in Australia the connection to development was not self-evident right away. The article obviously links the robotic trucks to the interest of the Pentagon in similar projects, but as we are currently seeing in the emerging debate around unarmed aerial vehicles/drones, in a short while the, say, WFP will probably be interested in using the technology to deliver supplies in crisis zones. It is actually not difficult to imagine a convoy of ‘robotic’ vehicles plowing through the desert and being ‘protected’ by UAVs. There will be a discussion about the pros, the cons and the ethical dimensions, of course, but one thing I find important to point out is that big companies, with big ideas and big equipment are ready to enter the aid industry-and that comes at a price. While smaller organizations may find it difficult to find money to run a one-day workshop for local journalists on how to use aid data, mobile phones for disasters or smart phones for using social media, a lot of technological excitement will be created around big technology. Who doesn’t want to see the robotic WFP truck arriving in a remote village where people desperately wait for supplies? 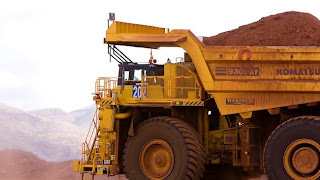 But big technology also needs critical commentators, because it is also possible that the technology that drives the robotic mining truck in this part of a country will be used as a CSR project stunt to drive supplies into remote corners in other parts of that country. As the article also points out, the technology is far from sophisticated yet. The trucks work on the ‘tedious’ mining site, but are unlikely to succeed in ‘smarter’, more complex terrains yet-especially if something or someone wants to stop them from moving around. The complex challenges in development will require human intervention rather than simple remote supervision from the safe distance of a control room. But there is a bigger picture involved that the article does not address: Routine, manual tasks that can be executed by modern ‘robots’ will be outsourced to them sooner rather than later. The fully computerized warehouse, mining site or postal delivery route are not exactly the material of science fiction. It will take longer before these technologies are implemented in a development context which gives humans a bit more breathing space for gainful employment. But I also have a feeling that these developments may actually add to the supply-demand pressure on development jobs. If a truck driver is turned down at a mining site, maybe work for the WFP is his (yes, there is a gender/masculinity/class/educational dynamic involved) alternative? Will this drive down salaries in the development industry? Will development become more inclusive and more regular people (the infamous ‘taxpayer’ politicians like to talk about) will join the industry? Are we prepared for this? Should we…?